At least 300 people, including lawmakers, their families and staff, were aboard the train from Washington bound for a Republican policy retreat in West Virginia. 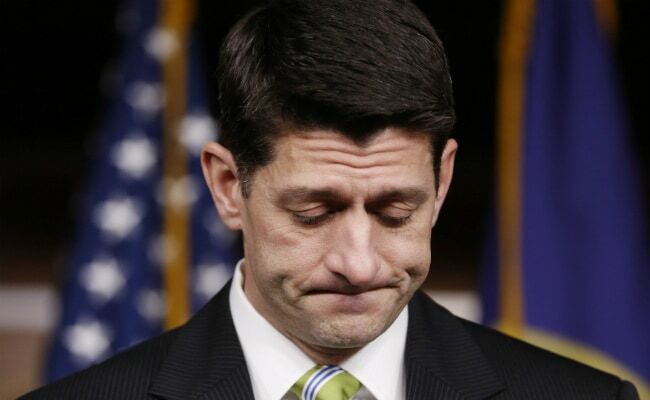 Washington, United States: A train carrying several dozen Republican lawmakers including US House Speaker Paul Ryan collided with a garbage truck Wednesday in Virginia, killing one person and sending six others, including a congressman, to hospital, officials said. The White House said no members of Congress were seriously injured, and that President Donald Trump had been briefed on the accident. The truck that was struck was carrying three people, one of whom was killed and another seriously injured, Senator Bill Cassidy, a licensed physician who helped attend to the injured, said on Twitter. "There is one confirmed fatality and one serious injury. There are no serious injuries among members of Congress or their staff," White House press secretary Sarah Sanders said in a statement. "Our thoughts and prayers are with everyone that has been affected by this incident." Train operator Amtrak said two crew members and three passengers were transported to a local hospital with minor injuries, and that transportation safety officials were investigating at the scene of the accident in Crozet. It said that while the event was under investigation, "this is an opportunity to remind everyone about the importance of exercising caution around railroad rights-of-way." The engine, which according to lawmaker photographs was mangled in the crash, derailed, but the rest of the cars remained upright on the tracks, according to Amtrak. Congressman Jason Lewis, a Republican from Minnesota, was taken to a hospital to be checked for a concussion, his office said. Congressman Tom Cole said first responders evacuated at least two people who were injured, and who were apparently on the truck. Shortly after the accident, Ryan's office said the House speaker was "fine." Vice President Mike Pence, who flew in later in the day, delivered an evening address to lawmakers at the three-day retreat west of the US capital. Pence said he was in the Oval Office with President Donald Trump when the news broke. "We were both deeply troubled at the initial reports but quickly relieved that the scope of the accident was not larger," he said. "Days like today especially I just want you to know -- to you and your families -- thank you for your service to America." Trump is due to headline the event on Thursday. House Republican Greg Walden tweeted a photograph of the scene, showing people standing off the train tracks next to a badly-damaged truck, with garbage and debris strewn on the ground. "We're fine, but our train hit a garbage truck. Members with medical training are assisting the drivers of the truck," Walden said. The accident quickly became a security concern for police and security personnel tasked with guarding members of Congress, as lawmakers jumped off the disabled train to aid the injured. Senator Jeff Flake described a chaotic scene along the tracks, where he said he helped carry a badly-injured man away from the truck and watched emergency responders try but fail to revive the person who died. "It was harsh, it threw everyone up in their seat," Flake told CNN of the impact. Last June, Flake was among several Republicans at a congressional baseball game practice when a gunman opened fire on lawmakers. Colleague Steve Scalise was gravely wounded, and Flake ran to his aid once the shooter was down. Dozens of Republican members of the House of Representatives and the Senate left Washington earlier Wednesday, the morning after Trump delivered his maiden State of the Union speech before Congress. They were bound for the historic Greenbrier resort in White Sulphur Springs, West Virginia, for their annual retreat. The event's organizers said the retreat "will proceed with an adjusted program," including a moment of prayer for those involved in the accident. Top House Democrat Nancy Pelosi said she was "praying that all are well both on the train and off."